Battle Royale is one of my favourite films of all time, having seen The Hunger Games last year I felt compelled to once again see this film due to the similarities that film had with it. As a side note apart from the first five minutes Battle Royale II: Requiem is not a good film and should be avoided. As an extra side note the novel Battle Royale by Koushun Takami (that the film was based on) is fantastic and very recommended reading! 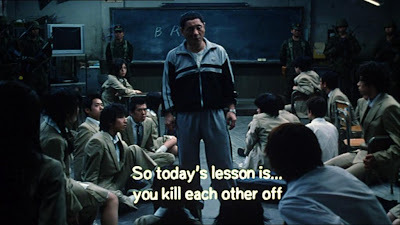 The film takes place in Japan in the near future where a piece of legislation named the 'Battle Royale Act' has been passed to combat the rising unrest by the young. By impartial lottery once a year a class of children are picked to be taken to a remote location and forced to fight to the death as a scare tactic for others. The teens are all fitted with explosive necklaces and given 3 days to fight until just one is left. More than one left after 3 days and the necklaces will explode. Shuya Nanahara (Tatsuya Fujiwara of Death Note) and his class mates are drugged and awake on a deserted island where their 7th grade teacher Kitano informs them of what awaits them. The rest of the film follows the class as they battle and fight to survive. Some decide to try and win, some try to hide while others come up with plans to try and escape the island. Shuya, his love interest Noriko and mysterious transfer student Kawada are the main characters. This was such a unique film at the time and still today feels quite unlike any other. Despite the grim tone of teens being forced to murder each other the film has quite a comic feel to it, violence is over the top with characters often taking ridiculous amounts to get killed, there are darkly humorous moments and some prolonged death sequences that give it a fun unrealistic feel. With a class of 42 kids there is plenty of room to fit in all the school stereotypes that exist. The geeky kids, the loners, the bullys and the bullied, the class joker; all are featured and it is interesting to see their interactions with each other as their day to day relationships change now they all have weapons and permission to kill. The teacher Kitano is a fantastic, unnerving character, having taught the class previously he knows them and for the most part dislikes them, he seems to have a lot of enjoyment being in charge of the act, commanding from the nerve centre, giving reports every 6 hours of which of the classmates have been killed, and giving light hearted advice to the survivors. Transfer student Kiriyama (who volunteered for the event) is menacing as the bad kid, for the whole film he doesn't utter a word, systematically killing everyone he comes across, he even gets his own theme tune that plays whenever he appears like he is some sort of boss character which reminded me of the Final Fantasy VII Sephiroth theme! Words cannot do justice to this film, I am having trouble expressing just how awesome this is, awesome scenes of violence (a severed head with a grenade jammed in the mouth thrown through a window is a fantastic moment) and great classical music to go with the violence that just fits perfectly. The plot is really interesting, you really come to care for a lot of the characters and the way that many different short stories are neatly fitted in creates a lot of emotion for characters when they die. At times it is almost like a collection of short stories, something that the book also gave the impression of. Some of the flashback sequences are not that exciting to see even if they do give some context for characters relationships, and the translation text is sometimes quite messily done but other than that this film is near perfect. 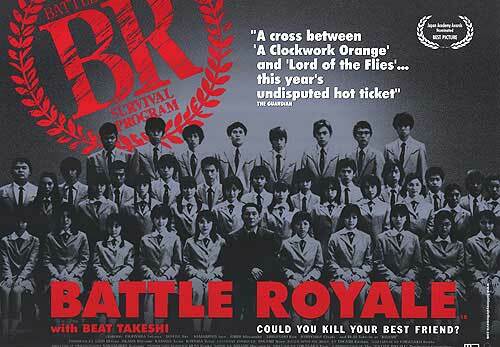 Battle Royale is a film I can just watch time and time again and never get bored of. 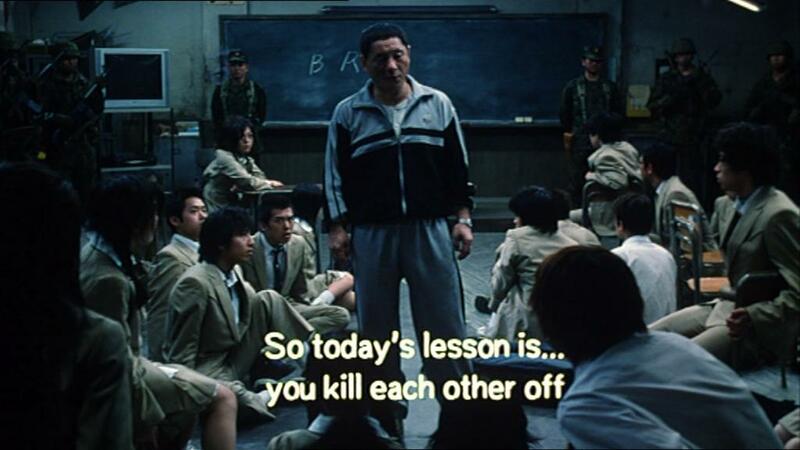 Love Battle Royale (not the extended director's cut though). Anyway, great review! I've been wanting to watch this again. I need to read the book. I'm glad the movie finally got a release in the US. I'll definitely pick it up then. Thanks!